e-learning resources for all healthcare professionals involved in research, audit and quality improvement. 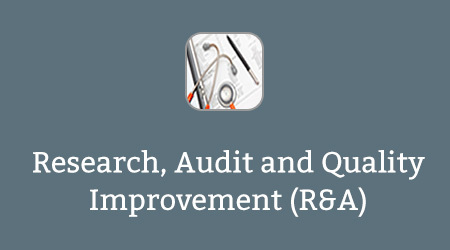 The Research, Audit and Quality Improvement programme is relevant to all healthcare professionals involved in research, audit and quality improvement. It introduces the learner to a variety of topics pertinent to clinical research, audit and quality improvement undertaken by the NHS and its academic partners. The Research and Audit Core Knowledge module is a joint project led by the Academy of Medical Royal Colleges and developed by the Royal College of Anaesthetists, in collaboration with Health Education England e-Learning for Healthcare (e-LfH). The educational aim of the module is to enable users to interpret the validity and reliability of healthcare data (e.g. clinical trials, reviews, audits) and respond appropriately with respect to their clinical practice. In addition, it provides the first steps for those contemplating a research or audit project. Throughout the module, users requiring more advanced and specialised information are directed towards additional resources available through e-LfH and other sources such as NHS Evidence. The Perioperative Improvement Science and Management (PRISM-ed) module has been developed and written by anaesthetists and experts in the field. It builds on the QI web resource http://www.prism-ed.com funded by UCLH/NIHR Surgical Outcomes and Research Centre (SouRCe) and the London Academy of Anaesthesia. The PRISM-ed e-learning module, based on the Improvement Science curriculum from the Royal College of Anaesthetists outlines key knowledge and training resources required to deliver quality improvement within healthcare. PRISM-ed is designed to assist with practical implementation through downloadable project toolkits and data templates. Although it is designed for doctors in anaesthetics training, the content is relevant and accessible to anyone in the perioperative multi-disciplinary team or wider health services, who wish to improve the quality of care they provide. If you already have an account with e-LfH, then you can enrol on to the Research, Audit and Quality Improvement programme by logging in to the e-LfH Hub, selecting My Account > Enrolment and selecting the programme. You can then access the programme immediately in the My e-Learning section. In the event that you do not qualify for free access to the Research, Audit and Quality Improvement programme, you are able to license access through eIntegrity, a community-interest company established for this purpose. For more information on the licensing options available for the Research, Audit and Quality Improvement programme, please visit the eIntegrity website. The Research, Audit and Quality Improvement programme is also available to NHS healthcare staff via the Electronic Staff Record (ESR). Accessing this e-Learning via ESR means that your completions will transfer with you throughout your NHS career.